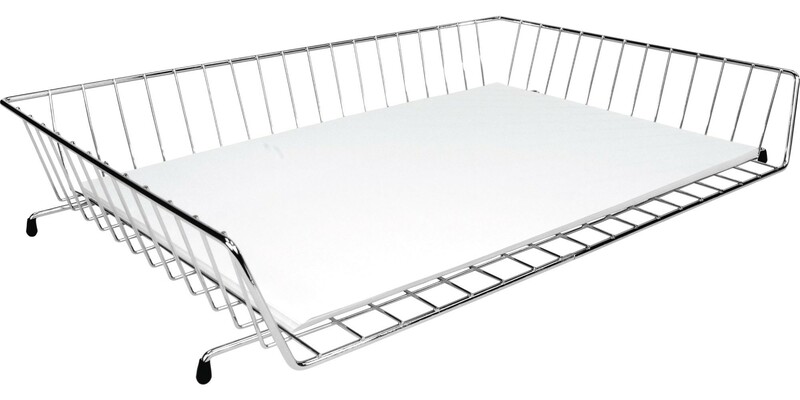 11 x 17 Wire Basket (sold per basket) - GS Direct, Inc.
Sturdy chrome basket for your oversize documents...made from heavy, coated wire and easy to stack. These wire baskets hold 11" x 17" size paper. We suggest a maximum capacity of 200 sheets of tabloid size paper. These baskets are stack-able allowing for more paper storage in the same area size footprint. Each 11x17 wire basket includes rubber boots on all four feet reducing the risk of scratching your desk top. Maximum Insert Size: 11" x 17"